It wouldn’t surprise me if there were Visa problems with coming to the US. Other than Babymetal, a lot of groups that do go abroad have been going to Europe, Mexico and Canada. The only group besides BM that has come to America for concerts recently is Necronomidol. Morning Musume did come to Houston in 2016. ANGERME Premium tickets for Paris sold out in only a few minutes. Could be a bug though, since at first it "forced" you to buy both tickets (you couldn't choose "0" as an option) and suddenly there were no more Premium tickets lol. Got a normal one, I think that's okay. The concert is the most important part after all. ^ Yeah, that's why I wonder why neither Juice=Juice nor °C-ute came to the US. The latter coming to Mexico was a big thing, but to skip a rather large part of fandom? That's weird. Yes, MM did visit the US in 2016. But because the girls are getting paid by the US sponsor, they can't travel on the visa waiver program (VWP) like a lot of short-term tourists. And with the current political/administrative climate, I think they'd want to play really close to the books, or just not getting their paperwork processed in a timely manner. And, I'm not sure how the current economic climate is affecting the sponsors. Yes, the stock market is rising, but I don't think the anime/cultural tourism industry is getting a huge boon by it. Oh this whole conversation is interesting. How do you find out more about sponsoring a musical group to come here to America. Is all that stuff on the American Department of State site, or is it part business practice along with part governmental practices? Uh Nonaka is now some kind of NBA ambassador and is in the US and therefore will be missing from the events in Japan? 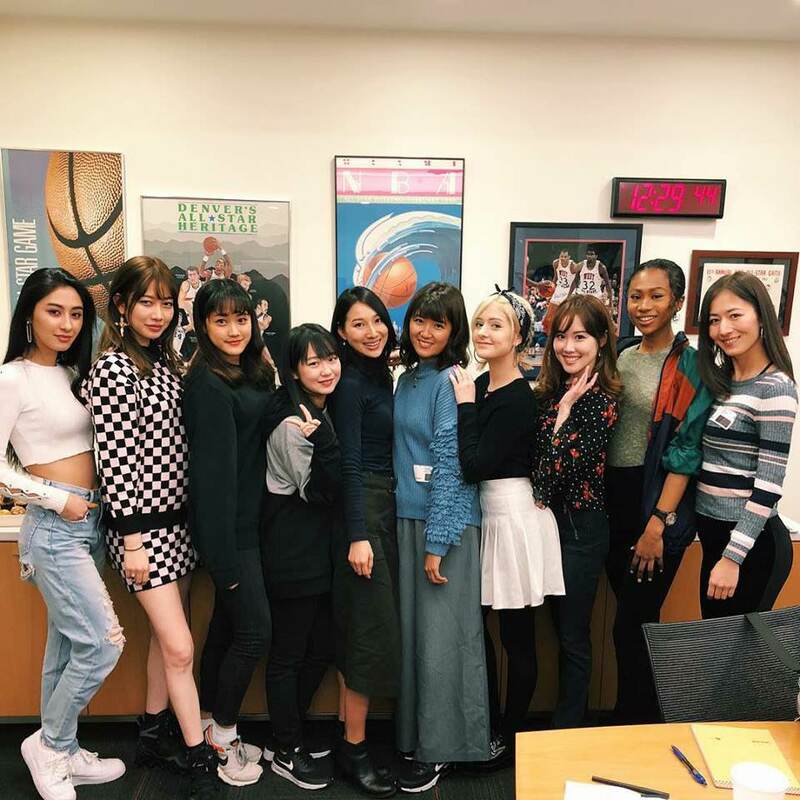 Chinami has also been tapped as an NBA ambassador. She is currently in NYC. Saw elsewhere that they're ambassadors for Rakuten TV, which makes the entire thing seem less silly. Top Yell is being discontinued after their March issue. They're the ones who do all the big H!P special issues. So close yet so far (the story of my life). Rakuten NBA posted this of all the ambassadors. They are currently training in New Jersey at the headquarters. Which, I assume is just them all getting a crash course in the fine art of basketball. The hashtag lists all the girls. But it's not in any order. So aside from Miki and Chinami I have no idea who any of the girls are. Chinami became quite dark, wow. Chi has always been pretty dark. How do we know which girl got which team dammit? I say as if I give any fucks about basketball. What exactly are they doing for the teams? Why were they sent here? Which one was assigned to a New York team? What does this mean for American fans of Miki and Chinami? Will we get to see them on local TV or something? It literally was announced yesterday. We don't have any information yet. Very unlikely. This is for Rakuten's streaming service in Japan. Karin is coming back tomorrow (for real this time). She'll be performing in a limited capacity. So she will be "partially participating" to J=J and H!P tours and they will decide again after the 12th. Mmh, not sure it is the best for her. Same. Honestly, I'm super pessimistic when it comes to stuff like this, but temporary deafness? Not a good sign, especially as a stage performer. Then again Kiki also basically bounces back into back pain every now and then (during some release event last week she fell and couldn't stand up on her own) and they still keep her in most activities. I mean if doctors gave them their ok I can't say much, but it doesn't feel right. Kiki will probably be Tsubaki's first graduate if they don't lose someone to school or something like that. Karin and Kiki are basically Aika types. Their bodies are failing them, but they still want to continue to fight it out and not give up. Eventually something will have to give. Unlike Aika though, Kiki and Karin are both front girls. So, if they do decide to leave their groups because their bodies finally win out, I think Up-Front wont hesitate to find something else for them to do if they so choose. True, there's always plenty of stage plays. Kiki especially will not redebut if she can't dance. That's a lot of Angerme. Because now that C-ute is gone, they are secretly the best HP group. Uh, not a strong winner lineup for the solo performances. Risa is in her first HinaFes shuffle and it's a solo? I can die now happily. 1) What happened to Ruru Danbara? 2) At 9:56, is that Manaka Inaba who's behind Momohime when Reina Ichioka's unit goes up to pick their slips of paper? 3) If not, who is it? If so, why is she with Reina's unit? 4) Does Reina's unit have a name yet? 1) Ruru missed some concerts due to flu, I guess she was still out when they filmed the lottery. 4) nothing has been said about her unit except for her being the leader. There are no members or a name yet. By the way, Ichioka, Kiyono Momohime, Takase Kurumi and Inaba Manaka are all in a state of not being part of any group. Kiyono and Takase aren't members of Ichioka's unit. Officially Manaka is a member of the Hokkaido Kenshuusei but has more freedom in her activities, doing solo events and a radio show - all on Hokkaido. Takase and Kiyono were supposed to join the theatre group of H!P. All four participate in the H!P concerts, though, as part of shuffle units and them doing their digital song Gobaku Can't Go Back.